IceBlinkBasic RPG EngineStory and Turn-based role playing game(RPG) engine implementing a classic old-school computer RPGstyle.Currently available for download (all are FREE) from withinthe app are the following adventures:- Hearkenwold (chapters 1 and2, by Dorateen)- The Elderin Stone (by Pongo)- Lanterna - The Exile(by me)Do you have a great story idea that you have wanted to getout of your head and into a cRPG? This may be the project thathelps you share that story.Now you can play, create and share yourown IceBlinkBasic (IBbasic) adventures! This app will allow you toplay any IBbasic adventure that you or others create. This app isthe exact same as the PC version of IBbasic and save game files canbe passed back and forth between them. In order to create anIBbasic adventure, you will need to download the free IceBlinkBasicRPG Toolset which is a program for Windows 7, 8 or 10. 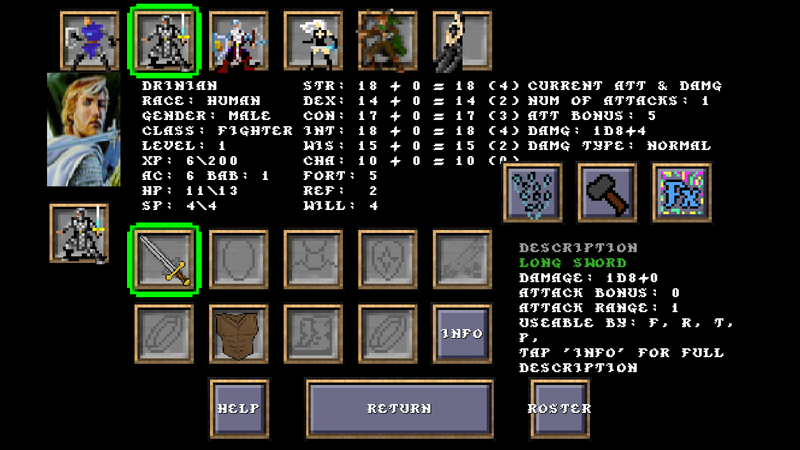 The toolsetwill create all the files needed by this IceBlinkBasic RPG app toplay your creation (your created adventure modules also work forthe PC version of the IBbasic engine).visit our website for linksand more info on thetoolset:http://www.iceblinkengine.comIceBlinkBasic RPG Features:-designed for phones and tablets.- FREE (no in-app purchases oradds, completely free).- turn-based combat similar in style to theSSI Gold Box games.- great RPG story telling conversation system.-single player RPG (you control all party members) game.TheIceBlinkBasic Engine is inspired by some of my favorite cRPGs (manybeing old retro style RPGs) such as the SSI Gold Box Games,original Bard's Tale, Ultima, and the Infinity Engine games (likeBaldur's Gate and Icewind Dale) and my 6+ years of experience withbuilding adventure modules in Neverwinter Nights 1 and 2.PrivacyPolicy - Data Gathered:Progress Reporting has been removed sincemany players were just turning it off anyway. We currently onlycollect the number of downloads for each module, high level datafor how much each module is being played, and basic crash data. Nopersonally identifiable information is collected. The number ofdownloads and how much each module is getting played will bereported to all the IceBlink community as a source of motivationfor module builders to keep building and sharing. Hearkenwold (an IceBlink Engine RPG)UPDATE: Hearkenwold's nextchapter (includes ch1 and ch2) is now available in the IceBlinkMini(IBmini) RPG app currently in the Google Play BETA channel (have alook under our other apps to find it). The IBmini app also hasavailable for download from within the app: The Elderin Stone andLanterna. Story and Turn-based role playing game (RPG) implementinga classic old-school computer RPG style.Story by DorateenCoding andsome artwork by slowdive_fanIceBlink Engine and port to Android byslowdive_fan (aka me)WARNING: SAVE OFTEN! This adventure byDorateen is very old school. There are a number of encounters thatare possible early on that a poorly equipped and under skilledparty will find very difficult, even near impossible. It is a riskreward kind of thing. A party size of six will be helpful. If anNPC gives you a warning, be careful. Sometimes, there is no warningif you wander from the path too much. Yet exploring in this moduleoften yields nice treats... decisions, decisions. SAVE OFTEN! !Hereis Dorateen's description:"This is a work-in-progress demo ofHearkenwold. 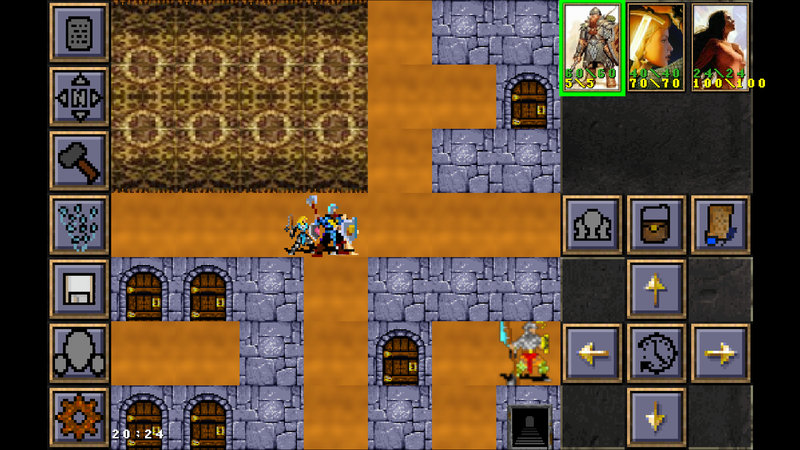 A classic party-based adventure heavily inspired bythe SSI Gold Box games, and in fact uses art assets (sprites andsome tiles) from the Forgotten Realms Unlimited Adventuresarchives. 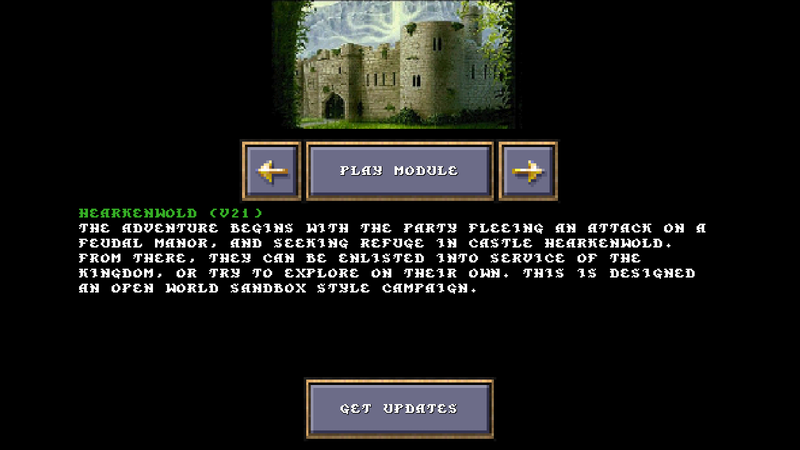 This campaign takes advantage of the IceBlink engine'sturn-based combat system and branching conversations, including"Party Chat" style dialogues where options are available tocharacters in the party, according to various conditionals such asclass, race, and ability scores.The adventure begins with the partyfleeing an attack on a feudal manor, and seeking refuge in CastleHearkenwold. From there, they can be enlisted into service of theKingdom, or try to explore on their own. Eventually this will be anopen world sandbox style campaign. For now, there are areaspartially filled with content that exists around a more structuredquest line. 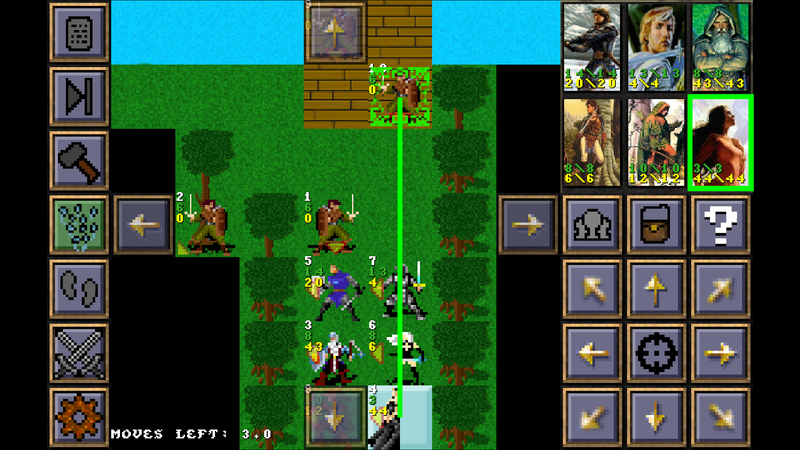 This demo can be considered to contain the first two"chapters" of the story, although more is being updated andexpanded.While not set in a specific world setting, Hearkenwolddoes draw upon the Dungeons & Dragons experience, with theaspiration of creating a pen and paper, rather than cinematic, typefeel. "Features:- NO ads or in-app stuff.- turn-based combat similarin style to the SSI Gold Box games.- great RPG story tellingconversation system.Progress Reporting Feature:A fun new way toshare your play through experience with others. There is a togglebutton on the main map screen labeled "PR" (bottom right togglebutton). Pressing this button will turn Progress Reporting on andoff. If you do not wish to share your play through experience, noproblem, just turn off Progress Reporting. If you do wish to share,leave the "PR" button on. If Progress Reporting is on, then at anumber of milestone events, it will send your party's current statsto our Google Analytics Dashboard. I will post the listings ofProgress Reports to our forums (see our website link below) forothers to share in the experience. No personally identifiableinformation is collected, just information about your party. Thetag that will separate your Progress Report from others is yourmain PC's name. 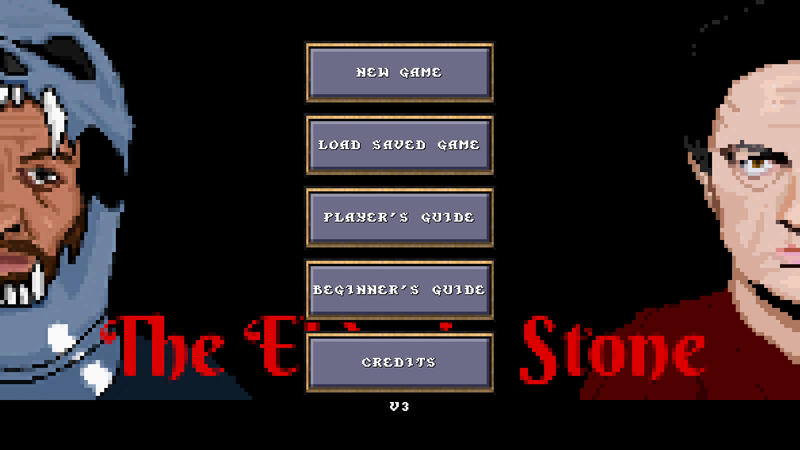 We are excited to see how others are enjoying ouradventure stories so we hope you enjoy this new feature as well.I'd like to add a few different threads for full party, duo, andsolo run play throughs.The IceBlink Engine is inspired by some ofmy favorite cRPGs (many being old retro style RPGs) such as the SSIGold Box Games, original Bard's Tale, Ultima, and the InfinityEngine games (like Baldur's Gate and Icewind Dale) and my 6+ yearsof experience with building adventure modules in Neverwinter Nights1 and 2. 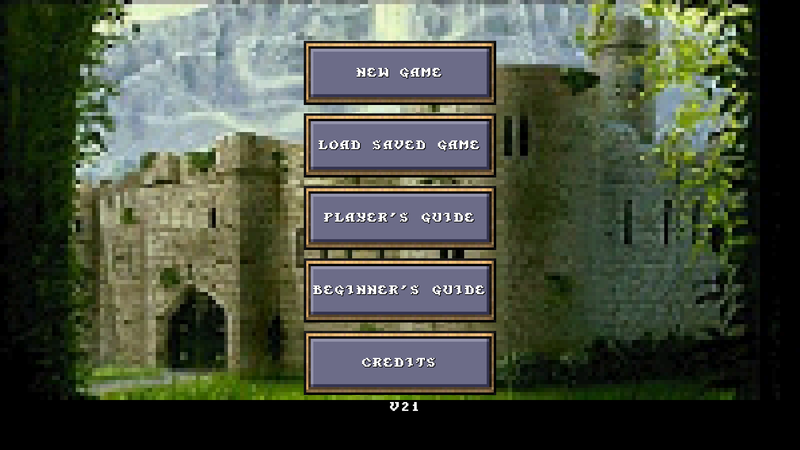 Lanterna - The Exile (an IceBlink Engine RPG)Story and Turn-basedrole playing game (RPG) implementing a classic old-school computerRPG style.This is the second adventure module converted for theIceBlink Engine Android Version (The Raventhal was the first and isavailable on Google Play for FREE). If you are not sure if you willlike this app, I would recommend that you download and try TheRaventhal first to see if you like the game mechanics and overallconcept.Story, music and most artwork by slowdive_fan and BreeArtsIceBlink Engine and port to Android by slowdive_fan (akame)Features:- designed for phones, but scales well on tablets (Ihave a galaxy tab 3 8").- low price, NO ads and NO in-app purchasestuff.- turn-based combat similar in style to the SSI Gold Boxgames.- great RPG story telling conversation system.- single playerRPG (you control all party members) game.- multiple companions canjoin your party.- talk with companions (see help button oncharacter sheet screen) to learn more about them and the world ofLanterna.- lots of replayability (is that a word? ).- three races,four classes and many spells to choose from.- multiple savesavailable (save often).- lots of items to find and wield.- this isa short story (2-4 hours) so, yes, it is short. It's an intro tothe Lanterna setting and will lead into the next adventure modulein the series, Lanterna 2 which is much larger (10-15hours).Progress Reporting Feature:A fun new way to share your playthrough experience with others. There is a toggle button on themain map screen labeled "PR" (bottom right toggle button). Pressingthis button will turn Progress Reporting on and off. If you do notwish to share your play through experience, no problem, just turnoff Progress Reporting. If you do wish to share, leave the "PR"button on. If Progress Reporting is on, then at a number ofmilestone events, it will send your party's current stats to ourGoogle Analytics Dashboard. I will post the listings of ProgressReports to our forums (see our website link below) for others toshare in the experience. No personally identifiable information iscollected, just information about your party. The tag that willseparate your Progress Report from others is your main PC's name.We are excited to see how others are enjoying our adventure storiesso we hope you enjoy this new feature as well.Lanterna - The ExileAdventure Module Description:"Almost 272 years have passed sinceElos led your people to this new world of Charn. Peace and growthreigned for many years, until recently. You have been taking careof your younger sister ever since your parents disappeared. Youwork at the docks, helping load and unload ships. The day seemed tobe going fine until you were interrupted by Andy with a messagefrom Dalin, the Chief Judge. Your sister has been abducted.Yourmain quest is to find your sister and free her. "Lanterna - TheExile was originally Created by slowdive_fan (me) for NeverwinterNights 1 (NWN), then NWN2, and then for the IceBlink Engine (IB). 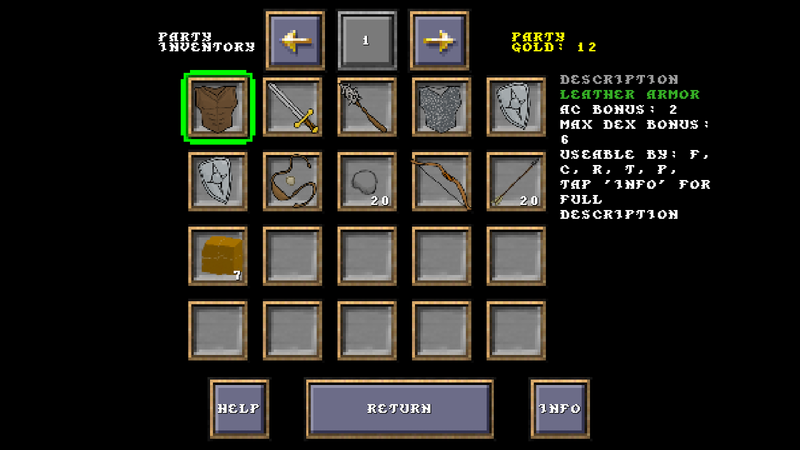 Iported the IB engine (original engine and toolset I created for thePC) to Android and converted The Raventhal and now Lanterna - TheExile adventure modules from the PC version to Android. 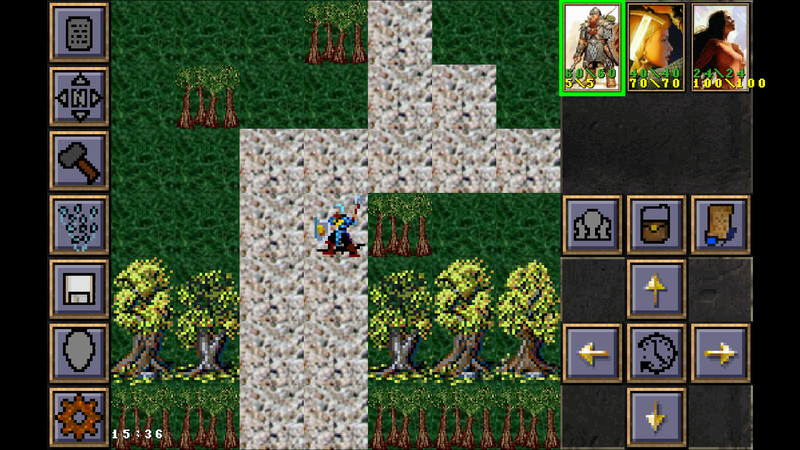 TheIceBlink Engine is inspired by some of my favorite cRPGs (manybeing old retro style RPGs) such as the SSI Gold Box Games,original Bard's Tale, Ultima, and the Infinity Engine games (likeBaldur's Gate and Icewind Dale) and my 6+ years of experience withbuilding adventure modules in Neverwinter Nights 1 and 2. Lanterna 2 (an IceBlink Engine RPG)Story and Turn-based roleplaying game (RPG) implementing a classic old-school computer RPGstyle.This app currently contains chapter 1 of 3. This app will beupdated with the next two chapters as they becomeavailable.Progress Reporting Feature:A fun new way to share yourplay through experience with others. There is a toggle button onthe main map screen labeled "PR" (bottom right toggle button).Pressing this button will turn Progress Reporting on and off. Ifyou do not wish to share your play through experience, no problem,just turn off Progress Reporting. If you do wish to share, leavethe "PR" button on. If Progress Reporting is on, then at a numberof milestone events, it will send your party's current stats to ourGoogle Analytics Dashboard. I will post a weekly listing ofProgress Reports to our forums (see our website link below and thenlook for the forums tab on our page) for others to share in theexperience. No personally identifiable information is collected,just information about your party. The tag that will separate yourProgress Report from others is your main PC's name. We are excitedto see how others are enjoying our adventure stories so we hope youenjoy this new feature as well. I'd like to add a few differentthreads for full party, duo, and solo run playthroughs. "Approximately 60 years have passed since The Great Battleof Charn (see "Lanterna 1"). After that battle, the creatures andfollowers of Zorn continued to grow in numbers and eventually runthe people of Charn from their homes. They escaped into the forestand eventually crossed through a great mountain range via themountain dwarves passage. On the other side of the mountain theybegan to build a small town with a few outlining villages. Thefollowers of Zorn eventually stopped hunting the Charnians andreturned to their lands. They began to lose focus (since there wasno one to torment) and eventually separated into different clansand tribes based on race (goblins, orcs, ogres, dark dwarves,zornians, etc.) About 10 years ago your (the PC’s) father, Adwen,led a large group of Charnians in an attempt to return to Charn.Since the attacks had pretty much ended, they felt that maybeZorn's evil creatures had all destroyed each other and returning toCharn would be safe. The caravan never returned. You and yourbrother were young at the time. Your mother has never recoveredfrom the loss of her husband. A month ago your brother led a smallgroup to try and find out what happened to the first caravan. Theywere only supposed to be gone for a couple of weeks, but haven'treturned. You have decided to form a very small (thus undetectableby the evil creatures) party to search for your brother. 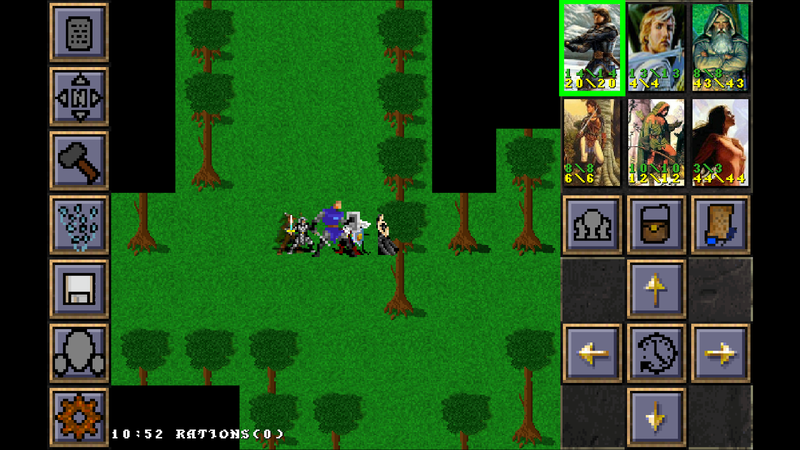 "Features:- designed for phones, but scales well on tablets (I havea galaxy tab 3 8").- NO ads and NO in-app purchase stuff.-turn-based combat similar in style to the SSI Gold Box games.-great RPG story telling conversation system.- single player RPG(you control all party members) game.- three races, five classesand many spells and traits to choose from.- multiple savesavailable (save often).- lots of items to find and wield.TheIceBlink Engine is inspired by some of my favorite cRPGs (manybeing old retro style RPGs) such as the SSI Gold Box Games,original Bard's Tale, Ultima, and the Infinity Engine games (likeBaldur's Gate and Icewind Dale) and my 6+ years of experience withbuilding adventure modules in Neverwinter Nights 1 and 2. The Raventhal (an IceBlink Engine RPG)Turn-based computer roleplaying game (RPG) with a wonderfully crafted story. Implementssome classic old-school computer RPG style and also includes great8-bit music created by Pongo.Story, music and most artwork byPongoIceBlink Engine and port to Android by slowdive_fan (akame)Features:- designed for phones, but scales well on tablets (Ihave a galaxy tab 3 8").- totally FREE with NO ads and NO in-apppurchase stuff.- turn based combat similar in style to the SSI GoldBox games.- great RPG story telling conversation system.- RPGoffline and single player (you control all party members) game.-multiple companions can join your party.- 8-bit retro music byPongo.- lots of replayability (is that a word? ).- three races, fourclasses and many spells to choose from.- multiple saves available(save often).- lots of items to find and wield.- A short story (2-4hours) with great pace and no fluff.The Raventhal (IceBlink RPG)description by Pongo:"You went fishing, capsized, and wake up coldand wet in the Raventhal, a forest with a very sinister reputation.Your one objective is to get out of the forest and return back toyour village. How hard can it be...! ?There's quite a bit of combat,but a big focus on the module is party interaction and story. Youstart off on your own, but you'll soon find other characters whomay join you if you choose. The NPCs are a colourful bunch who talkamongst themselves, disagree with your decisions, and(occasionally) do something useful. Of course, you can alwaysdecide just to ignore them all and play solo. "Progress ReportingFeature:A fun new way to share your play through experience withothers. There is a toggle button on the main map screen labeled"PR" (bottom right toggle button). Pressing this button will turnProgress Reporting on and off. If you do not wish to share yourplay through experience, no problem, just turn off ProgressReporting. If you do wish to share, leave the "PR" button on. IfProgress Reporting is on, then at a number of milestone events, itwill send your party's current stats to our Google AnalyticsDashboard. I will post the listings of Progress Reports to ourforums (see our website link below) for others to share in theexperience. No personally identifiable information is collected,just information about your party. The tag that will separate yourProgress Report from others is your main PC's name. We are excitedto see how others are enjoying our adventure stories so we hope youenjoy this new feature as well.The Raventhal was originally Createdby Pongo for the IceBlink Engine (IB). I ported the engine toAndroid and worked with Pongo to convert The Raventhal as the firstadventure module conversion to Android. The IceBlink Engine isinspired by some of my favorite cRPGs (many being old retro styleRPGs) such as the SSI Gold Box Games, original Bard's Tale, Ultima,and the Infinity Engine games (like Baldur's Gate and IcewindDale...definitely check out Baldur's Gate Enhanced Edition andIcewind Dale: Enhanced Edition by Beamdog now on Android, Yeah!...I own way too many versions of the Infinity Engine games now,haha) and my 6+ years of experience with building adventure modulesin Neverwinter Nights 1 and 2. 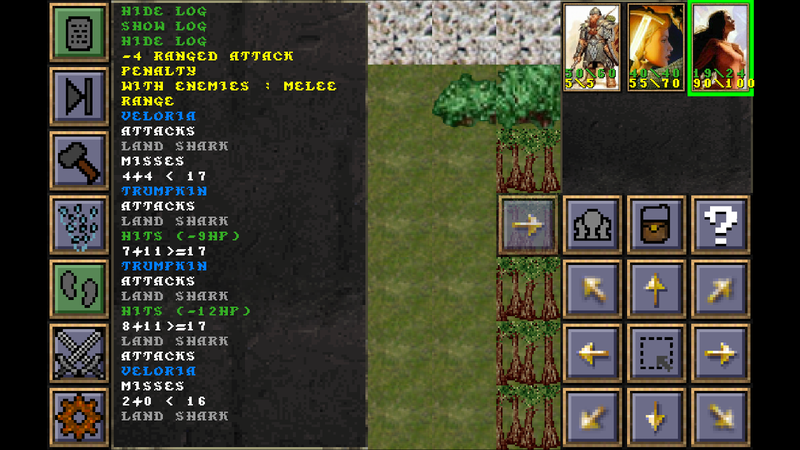 IceBlink RPG EngineStory and Turn-based role playing game (RPG) engine implementinga classic old-school computer RPG style.Do you have a great story idea that you have wanted to get outof your head and into a cRPG? This may be the project that helpsyou share that story.Now you can play, create and share your own IceBlink (IB)adventures! This app will allow you to play any IB adventure thatyou or others create. In order to create an IB adventure, you willneed to download the free IceBlink RPG Toolset which is a programfor Windows XP, 7, or 8. The toolset will create all the filesneeded by this IceBlink RPG app to play your creation.visit our website for links and more info on the toolset:http://www.iceblinkengine.comREQUIREMENTSTo Play: to play the included demo adventure module, noadditional requirements are needed. To play modules made by others,you need to have the ability and a basic understanding of how tofind and move files on your android device (there are many greatandroid apps for file/folder managing on Google Play).To Create: The free IceBlink RPG Toolset is a Windows PCapplication so you need a Windows XP, 7, or 8 system to run theToolset. You also need to have a way to transfer your projectfolder from your PC to your Android device. Patience, friendlyattitude and a willing to join the community on the forums goes along way in learning the Toolset and helping each other out toimprove the project going forward.PLAYThe IceBlink RPG app comes with Unwanted Guests as a demomodule. Launch the app and click on "Play" to try out this quickdemo that showcases all the latest features added to the engine andtoolset. As other modules are created by you and the community,download and play them as well. Unlimited amount of adventures arepossible!CREATEVisit our website to find a link to the free download of theIceBlinkRPG Toolset (Windows PC application). You don't even needto purchase this app to try the Toolset and see what you think.This app is need in order to test and play your adventure modulesthat you create with the Toolset. Check out the Builder's Guide toget started with the Toolset and make your first IceBlink RPGadventure module.SHAREAfter completing and testing your module, upload your file to sharewith others and our small and enthusiastic community of players andbuilders. Visit or website for more information on where to postyour creations.IceBlink RPG Features:- designed for phones, but scales well on tablets.- low price, NO ads and NO in-app purchase stuff.- turn-based combat similar in style to the SSI Gold Boxgames.- great RPG story telling conversation system.- single player RPG (you control all party members) game.The IceBlink Engine is inspired by some of my favorite cRPGs(many being old retro style RPGs) such as the SSI Gold Box Games,original Bard's Tale, Ultima, and the Infinity Engine games (likeBaldur's Gate and Icewind Dale) and my 6+ years of experience withbuilding adventure modules in Neverwinter Nights 1 and 2. The Birthday (an IceBlink Engine RPG)This is an adventure moduleoriginally written (by Zach Holbrook) for Obsidian’s firstNeverwinter Nights 2 contest (theme: “Grimm’s Fairy Tales”).Converted to the Android version of the IceBlink RPG Engine.Zachhas won numerous awards and accolades for his NWN2 modules (TheBirthday and Harp & Chrysanthemum) including Module of the Year2007, Reviewers Award, Obsidian Contest Winner (2nd), Golden DragonAward, and two Hall of Fame awards.This is the fourth adventuremodule converted for the IceBlink Engine Android Version (TheRaventhal, Lanterna and Red Carnival are also available on GooglePlay).Story, music and some artwork by Zach HolbrookCoding and someartwork by slowdive_fanIceBlink Engine and port to Android byslowdive_fan (me)Features:- designed for phones, but scales well ontablets- FREE, NO ads and NO in-app purchase stuff.- turn-basedcombat similar in style to the SSI Gold Box games.- great RPG storytelling conversation system.- multiple very different endings.-single player RPG (you control all party members) game.- soloadventure, no companions in this module.- three races, four classesand many spells to choose from.- multiple saves available (saveoften).- lots of items to find and wield with unique names andawesome descriptions (back stories).- this is a short story (1-3hours) so, yes, it is short. It was designed for the NWN2 contestand was required to be short.Progress Reporting Feature:A fun newway to share your play through experience with others. There is atoggle button on the main map screen labeled "PR" (bottom righttoggle button). Pressing this button will turn Progress Reportingon and off. If you do not wish to share your play throughexperience, no problem, just turn off Progress Reporting. If you dowish to share, leave the "PR" button on. If Progress Reporting ison, then at a number of milestone events, it will send your party'scurrent stats to our Google Analytics Dashboard. I will post thelistings of Progress Reports to our forums (see our website linkbelow) for others to share in the experience. No personallyidentifiable information is collected, just information about yourparty. The tag that will separate your Progress Report from othersis your main PC's name. We are excited to see how others areenjoying our adventure stories so we hope you enjoy this newfeature as well.The Birthday Adventure Module Description by ZachHolbrook:"OVERVIEW: This is a mod written for Obsidian’s first NWN2contest (theme: “Grimm’s Fairy Tales”). It is a medium-magic,high-wonder adventure, as befits a story adapted from a fairy tale.But which one? You'll have to find out! SYNOPSIS (no spoilers):Today is a festive day in the small village called Schafberg. Atalented foundling, raised by a shepherd and his wife on a nearbyfarm, has come of age, and now the young paragon's adoptive parentshave brought their ward to town to speak to the Matron. BeforeSchafberg can rightly celebrate the birthday, a coming-of-agetradition known as "the birthday errand" must be honored, and theMatron reveals what that errand is to be. "The Birthday wasoriginally Created by Zach Holbrook for the Neverwinter Nights 2Obsidian "Grimm's Fairy Tales" Module Contest. I converted themodule (with Zach's permission) to the Android version of theIceBlink Engine (IB). I ported the IB engine (original engine andtoolset I created for the PC) to Android and converted TheRaventhal, Lanterna - The Exile, Red Carnival and now The Birthdayadventure modules from the PC versions to Android. The IceBlinkEngine is inspired by some of my favorite cRPGs (many being oldretro style RPGs) such as the SSI Gold Box Games, original Bard'sTale, Ultima, and the Infinity Engine games (like Baldur's Gate andIcewind Dale) and my 6+ years of experience with building adventuremodules in Neverwinter Nights 1 and 2. Red Carnival (an IceBlink Engine RPG)Story and Turn-based roleplaying game (RPG) implementing a classic old-school computer RPGstyle.This is the third adventure module converted for the IceBlinkEngine Android Version (The Raventhal and Lanterna are alsoavailable on Google Play).Story, music and most artwork by Karl(youngneil1)Coding and some artwork by slowdive_fanIceBlink Engineand port to Android by slowdive_fan (aka me)Features:- designed forphones, but scales well on tablets (I have a galaxy tab 3 8").-FREE, NO ads and NO in-app purchase stuff.- turn-based combatsimilar in style to the SSI Gold Box games.- great RPG storytelling conversation system.- single player RPG (you control allparty members) game.- multiple companions can join your party.-five races, four classes and many spells to choose from.- multiplesaves available (save often).- lots of items to find and wield.-this is a short story (2-3 hours) so, yes, it is short. It's anintro to the Grahir setting. Larger campaign to come.ProgressReporting Feature:A fun new way to share your play throughexperience with others. There is a toggle button on the main mapscreen labeled "PR" (bottom right toggle button). Pressing thisbutton will turn Progress Reporting on and off. If you do not wishto share your play through experience, no problem, just turn offProgress Reporting. If you do wish to share, leave the "PR" buttonon. If Progress Reporting is on, then at a number of milestoneevents, it will send your party's current stats to our GoogleAnalytics Dashboard. I will post the listings of Progress Reportsto our forums (see our website link below) for others to share inthe experience. No personally identifiable information iscollected, just information about your party. The tag that willseparate your Progress Report from others is your main PC's name.We are excited to see how others are enjoying our adventure storiesso we hope you enjoy this new feature as well.Red CarnivalAdventure Module Description by Karl:"Red Carnival is a shortfantasy adventure module for the IceBlink Engine (IB). It sends youon a fantastic journey to the little, unfortunately trouble riddenvillage of Broken Antler far in the north of Cormondor, the FirstKingdom of Men on Grahir. Grahir is the name of the world's maincontinent and also the name of a large campaign I plan to developfor IB in the coming months and years. Red Carnival is a mereprelude to that campaign. "Note from Karl the Author of RedCarnival: "The gameworld of Grahir and all relevant lore content -e.g. names, places, characters, stories, setting, background -remain an exclusive IP of mine in any case (as I write a fantasynovel on that and will use it for the upcoming campaign). "RedCarnival was originally Created by Karl for the IceBlink Engine(IB) while the engine was still in the Alpha stage. 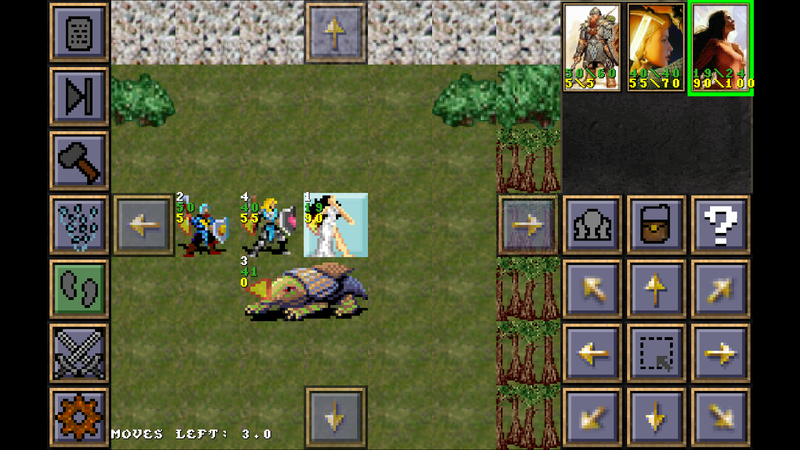 I ported the IBengine (original engine and toolset I created for the PC) toAndroid and converted The Raventhal, Lanterna - The Exile and nowRed Carnival adventure modules from the PC versions to Android. 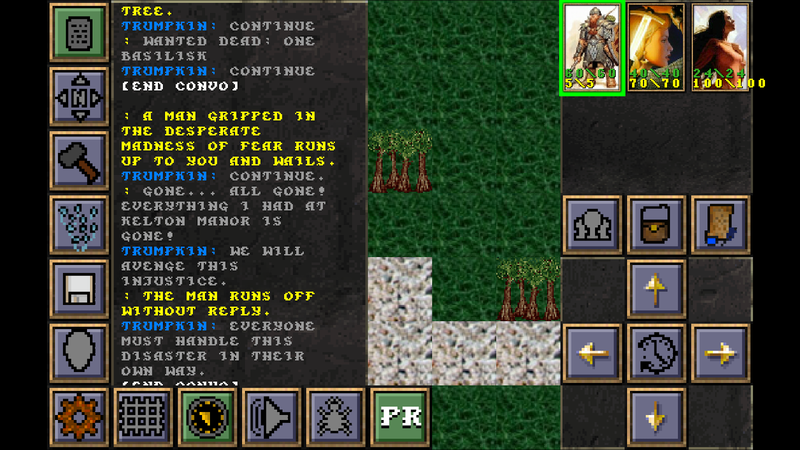 TheIceBlink Engine is inspired by some of my favorite cRPGs (manybeing old retro style RPGs) such as the SSI Gold Box Games,original Bard's Tale, Ultima, and the Infinity Engine games (likeBaldur's Gate and Icewind Dale...be sure to check out Baldur's GateEnhanced Edition and Icewind Dale Enhanced Edition now on Android)and my 6+ years of experience with building adventure modules inNeverwinter Nights 1 and 2. 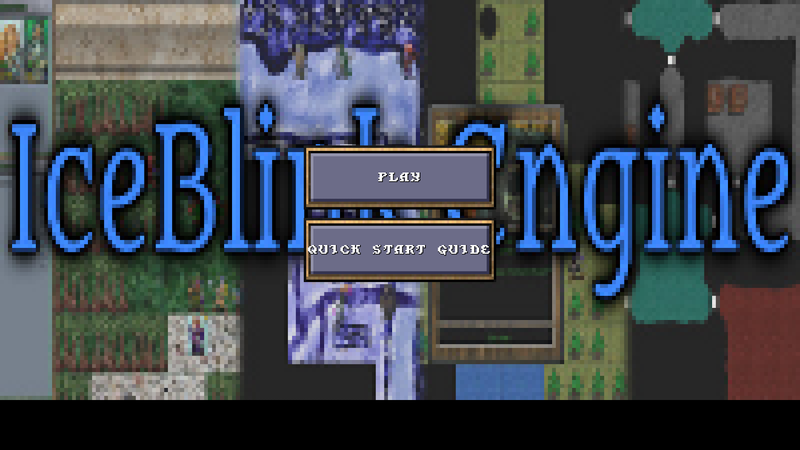 IceBlink 2 RPG EngineStory and Turn-based role playing game (RPG) engine implementinga classic old-school computer RPG style.This is a BETA version for builders to test, submit bugreports, suggest polishing and ideas, etc. Do NOT download unlessyou are willing to deal with bugs, otherwise please wait until thebeta testing period is over and the official release.Do you have a great story idea that you have wanted to get out ofyour head and into a cRPG? This may be the project that helps youshare that story.Now you can play, create and share your own IceBlink 2 (IB2)adventures! This app will allow you to play any IB2 adventure thatyou or others create. This app is the exact same as the PC versionof IB2 and save game files can be passed back and forth betweenthem. In order to create an IB2 adventure, you will need todownload the free IceBlink 2 RPG Toolset which is a program forWindows 7, 8 or 10. The toolset will create all the files needed bythis IceBlink 2 RPG app to play your creation (your createdadventure modules also work for the PC version of the IB2engine).visit our website for links and more info on the toolset:http://www.iceblinkengine.comREQUIREMENTSTo Play: to play the included demo adventure module, noadditional requirements are needed. To play modules made by others,you need to have the ability and a basic understanding of how tofind and move files on your android device (there are many greatandroid apps for file/folder managing on Google Play).To Create: The free IceBlink 2 RPG Toolset is a Windows PCapplication so you need a Windows 7, 8 or 10 system to run theToolset. You also need to have a way to transfer your projectfolder from your PC to your Android device. Patience, friendlyattitude and a willing to join the community on the forums goes along way in learning the Toolset and helping each other out toimprove the project going forward.PLAYThe IceBlink RPG app comes with Unwanted Guests as a demomodule. Launch the app and click on "Play" to try out this quickdemo that showcases all the latest features added to the engine andtoolset. As other modules are created by you and the community,download and play them as well. Unlimited amount of adventures arepossible!CREATEVisit our website to find a link to the free download of theIceBlink 2 RPG Toolset (Windows PC application). This app is neededin order to test and play your adventure modules that you createwith the Toolset. Check out the Builder's Guide to get started withthe Toolset and make your first IceBlink 2 RPG adventuremodule.SHAREAfter completing and testing your module, upload your file to sharewith others and our small and enthusiastic community of players andbuilders. Visit or website for more information on where to postyour creations.IceBlink 2 RPG Features:- designed for phones and tablets.- FREE.- turn-based combat similar in style to the SSI Gold Boxgames.- great RPG story telling conversation system.- single player RPG (you control all party members) game.The IceBlink 2 Engine is inspired by some of my favorite cRPGs(many being old retro style RPGs) such as the SSI Gold Box Games,original Bard's Tale, Ultima, and the Infinity Engine games (likeBaldur's Gate and Icewind Dale) and my 6+ years of experience withbuilding adventure modules in Neverwinter Nights 1 and 2. Heed the call of the magicians guild - conjurers, witches, archersand templars are needed! Monsters and dragons roam the realm, andyour friends have already picked up the gauntlet, bow and arrow aswell as sorcerer hats to raid dungeons, gain fame, and fightwarlocks in the arena against other guilds! Guild of Heroesdelivers everything the classic fantasy has to offer, with deviousdwarves and ancient elves, nasty orc shamans and troll sorcery,epic action and dark caves, quests and raids as befits anatmospheric medieval style RPG in the lineage of tabletop games.However, the epic journey through the huge, colorful game world isnot only fairy tales of mystic dungeons and dragons, but alsobattle against mages in the arena, controlled by other players! Ina nutshell: ★ Action-packed fantasy RPG in impressive game graphics★ Equip character classes such as mage, hunter and warrior,interchangeable at any time ★ PVP against other teams in arenaguild wars ★ Craft medieval weapons and armor with hundreds ofcombinations ★ Thousands of different monsters from diabolicexorcists to ... oh, discover for yourself! Now, enough of theheroic ballads; grab your wand, sword and shield, and into excitingfree fantasy RPG! Oh, do not forget: Follow the Guild of HeroesCommunity on Facebook - Events, Fan Art, Guild Friends and Contestsare waiting to be explored!